It is a black Appearance knit which is good to wear with a lovely sensibility. Basic vNeck Knit that you can wear softly with cashmere touch sense! V neckline and knit the button at the back of the sleeves and back! Neckline It is an attractive knit with a lace inside the sleeve and the inside! It is pastel color knit which is good to wear in spring enough to want to collect all by color. Unbalanced button on neckline and lace are mixed. Dressing from spring to summer Good It is a knit to show the material and body line beautifully! It is short-sleeve knit which is good in stretch and is satisfactory even in activity. I wear it now from the early days until autumn with the knit yarn which is not hot even if I wear it now. Tensel knit to cover the hips by rounding, good cover on the body cover! From the neckline to the skirt shibori Till! Make a romantic line! Feminine pearls decorate my muffler. It is a detail that the collection value is felt enough even with one knit alone. It is a high quality knit with perfect softness and soft touch. This is a shameless bearded item consisting of 5 sets of antagonistic knits and cardigans. I am comfortable without antagonizing my neck in antagonistic style! Soft Cashmere Wear gently with a touch! Boat neck line is the right choice It is bonus! It's an eye-catching design. It is warm and not thick. Layered to Just in a light or trench coat. It is spring knit of the pit which it is not enough for the knit only or the layered look and is a little spare! Knit full of praise in the real review of the first try! More than wearing 200% satisfaction because it is more beautiful! The shibori is wide and the volume pit which naturally occurs is very pretty. I want to hold it by color. I like to wear it as a Nitro inner of a slim fit cap sleeved line that feels in the water. It is light knit to be able to wear from now on. It has a long side and it has a falling pit. 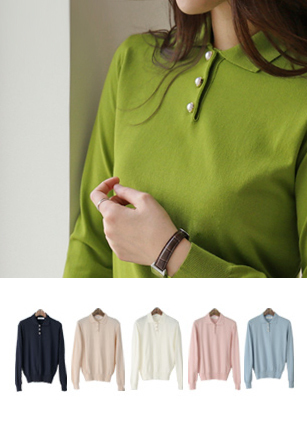 Feel the feminine pearl button on the collar Knit! It's a Golgi knit that looks better. Basic Knit needed for chilly weather! Sparing to the sense of volume but slim, knit! Advanced Cashmere and super fine wool material is excellent in quality! 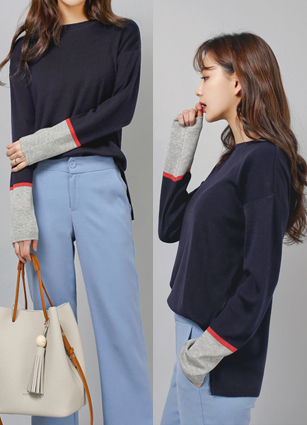 Chic color harmony dotboyeo also more stylish up! Directing me a good weave slender silhouette corrugated material! It is also good to use it as a two piece item of pants line separately. It's a Chic feel with a knit-top style that's wrapped around your neck.